The compact design of the 3M� DBI-SALA� Trigger2Trigger Coil Tether makes it the perfect lanyard to be used from Wristbands. The Trigger2Trigger Coil Tether features a lightweight vinyl material that makes clean-up and decontamination easy. 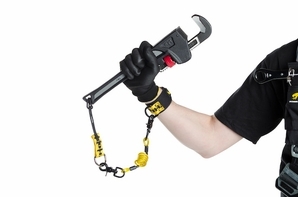 Trigger snaps on both sides of the lanyard make connecting to attachment points effortless, even while wearing safety gloves. User-friendly thumb triggers are provided on both ends of the lanyard and are easy to use even while wearing gloves. The Trigger2Trigger Coil Tether features a lightweight vinyl material that makes clean-up and decontamination easy. � Standards: Capital Safety Gen. Mfg. Req.